One of your Flip camera’s buttons is the Delete button. 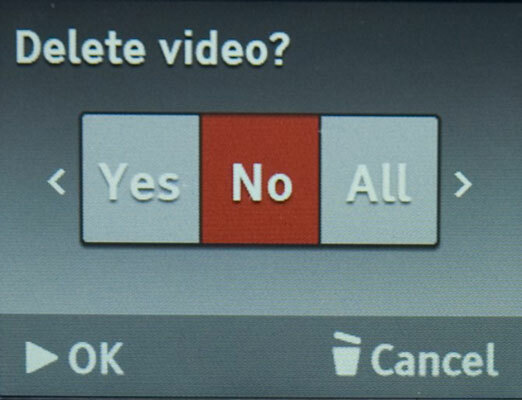 As its tiny trash can label suggests, pressing the Delete button is how you erase a video file (or files) from your Flip Video camera’s memory. You typically delete a video file from your Flip because the shot was a dud and you don’t want (or can’t stand) to watch the video file anymore, or because you already transferred a copy of the video file to your computer and you want to make room on your Flip’s memory storage to capture new video footage by deleting the video file (or files). Unlike your computer, your Flip doesn’t have a recycle bin to root around in to retrieve video files you deleted by accident or on purpose. However, pressing the Delete button does prompt your Flip to ask whether you’re sure you want to delete the currently displayed video file (or all the video files stored on your Flip), as shown here. A considerate feature indeed. But there’s a second, even more-thoughtful setting you can turn on that packs protection against accidental erasure called the Delete Lock feature. Unlike your Flip’s date, time, and other settings that you change in the settings options screens described in the previous pages, the Delete Lock setting is one you might never stumble upon unless someone tells you about it. Simply put, the Delete Lock feature forces you to unlock the Delete button before you can press it again to delete the file you want to delete. The extra second it takes you to unlock the Delete button causes you to think twice before you press the Delete button again, minimizing your chances of deleting a file you didn’t really want to get rid of. By completing the following steps with your powered-on Flip in your hand and your thumb at the ready, you can activate your Flip’s Delete Lock feature. Press and hold the Delete button until the Delete Locked message appears. A moment later, the live camera view reappears. When you press the Delete button to delete a video file you’re viewing, the Delete Locked message appears, preventing you from actually deleting the file (or files) until you unlock the Delete Lock feature. Press and hold Delete until the Delete Unlocked message appears. When you press the Delete button to delete a file you’re viewing, the Delete Video? screen appears. Press the Left or Right buttons to choose Yes, No, or All, and then press Play to make your choice. You can also press the Delete button again to cancel your choices and return the display to the live camera view.